Time, we are told, can be our best friend or equally our worst enemy. This week time showed its bad side to me, actually it might have been doing this for some weeks when I stop and think about it. 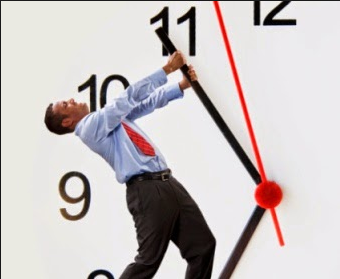 When you feel the pressures of time, you seem like you are “fighting the clock”, it just seems to heap more pressure on you and that need to break out, that spark of creativity, seems to have been buried under an avalanche of what keeps coming into you. The acceleration of what keeps landing on your desk, crying out to be read, answered or translated into something more. 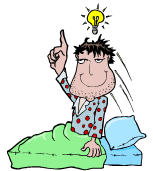 Of course, most of us are that rational type and we tell ourselves most of this is self-imposed or is it? I think most of this is externally-imposed. I blame the advancement of our social tools and all the multitudes of opinions, thoughts, suggestions that are ‘spewing’ forth in streams and becoming so overwhelming you begin to go ‘stir’ crazy. I equally blame myself for getting so hooked. This is not simply a time problem, it is deeper than this. It is actually tickling away at fear, it is giving a growing intense feeling of apprehension, anxiety and inner turmoil. I think I’ve been suffering this for some time. I’ve got FoMO thanks to all these social platforms I feel I need to connect into. Each day is getting into a growing dangerous routine. I arrive into the office my early routine- check my emails, check twitter, check the blog, check facebook, it is eating into my time but I need it. Do I really? This is social anxiety with a big kicker. FoMo – that fear of missing out. Then we have the staggering array of social networks constantly prompting us to check out our Klout status or your Kred score or the latest articles in our designated areas of interest. Then you go in search of the scoops of the day. You must feed the hungry beast, baying for your time. Then the daily snippets, LinkedIn reminders, slideshare updates, headline notifications and then the drip of the dailies from paper.li capturing all the breaking stories you subscribed too, needed you felt for your work. Were they? This is angst, an acute anxiety type, I am dreading where this is all going. So do we really need all these ‘social’ interactions, are they profitable investments or just simply satisfying events and quick fixes. No, we just want to all feel loved, special, in the loop and by giving something back into this, achieve a little respect. What are we really getting out of them? We reply, we contribute and we feel productive but are we, are we economically productive? Now if this economic productivity is happening then great. That is defined as increasing the economic value or are social platforms just simply sucking the economic life out of us all? The reality is it is dulling our own creative processes. Is it spurring us to do more within our own work? Is it not undermining the precise kind of creative thinking for us to do our own creative work? It is blurring us, it is surely this constant ‘mass’ of contribution that chips away at making us less individually distinct, perhaps a new form of defocused aberration. The higher the intensity of this social ‘interaction’ the more we get defocused, not actually more focused, I feel. Then we come to Kiasu. Anyone who has ever lived in Singapore will recognise this word. They even have a Mr. Kiasu. This really is a wonderful word for that “fear of missing out”. I think it applies to me more and more. I’ve caught the dreaded Kiasu fever. Kiasu is a mental attitude, it is always looking for a sense of opportunity. This has its positive sides but it shows itself far more in its less attractive ones. It makes you feel if you don’t do something now it will be missed opportunity and where it adds a real pressure on you, is you have this fear that it will not be simply lost, it will go to someone else. So you experience with Kiasu a sense of lost opportunity and a growing disadvantage in relation to other people who are ‘working’ the social scene. This feeds compulsion that I equally have to do something now, it is my own sense of obligation kicking in as I owe it to myself and so I have to do it. This nicely links into a pressure to compete with others and I can’t lose out, can I? Anna Wierzbicka wrote on Kiasu “Singapore English- a semantic and cultural perspective” that does an excellent job of describing much around Kiasu. Also David Chan Wah offered a essay some time back on “Kiasuism and the withering away of Singaporean creativity” with the wonderful maxim of “better grab first, later no more”. In Singapore, Kiasu manifests itself in queue jumping or others barging in front of you, with perhaps, if you are lucky, only a simply “sorry lah”, it also is seen on the roads when no one likes to give way when lanes are merging. Kiasu is deeply ingrained into Singapore ‘s psyche, it has its good and bad points. Growing up with Kiasu and its pressures often makes for ambitious business people; you become ‘big’ on working towards number one. The problem is always double edged, winning is never totally sweet as it carries the dread of ceasing to win, to get ahead, to ‘grab’ the opportunity. 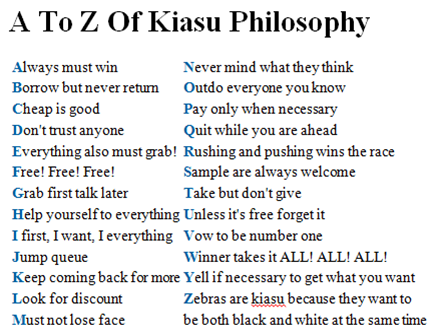 There is even a A to Z of Kiasu I came across sometime back, although I’m not sure of its source on the sometimes amusing side of Kiasu in Singapore. I think we should compile one for our growing social anxieties of that FoMO. We of course, do need to devote time to reaching out, reading, responding, to gathering in and absorbing but we do need our own plans of what amount of time we should spend on this and its ultimate purpose. We need to certainly find time, to make available time as others offering their thinking and experiences does help us relate and often make sense of our world. It does stimulate our creative process but it is the ‘act’ of filtering but this can’t be imposed by a simple click of a delete button, it has to be more than this. The pressure today is externally- imposed but we need to regain the upper hand by making this flow of social interactions coming to us, like a social tsunami, by taking back control to make it far more self-imposed. My anxieties, my FoMO needs redirecting into greater economic worth. Recognizing the symptoms is a start. We all I feel, need to be more selective, more discerning to make our own insights more personally creative and not becoming even more elusive, growing reliant just on our ‘feeds’ being beamed in daily to dull our creative brain, by simply adding to them. We need to ‘carve’ out our own time to allow our ‘creative juices’ to flow more, I forgot to get this jab shot recently, where is that creative needle? Becoming more selective- is that my answer? So I need to come to grips with all this. I’m not sure if all this inflow is helping as much as it should be, it is not generating what I think it should be, certainly from the time I seemingly put into it. I need to break into this with a different perspective, it is sucking up far to much of my time. But as Mr Kiasu says in Singapore English “I’ve got to get my money’s worth lah!” I’ve got to “everything also I want” and “everything must grab” with “everything also want extra” but with more of “everything also sure win“. Work that out! Innovation is increasingly moving beyond the previous boundaries of just being left to each organizations scientists or marketing departments, those days are seemingly long gone. Today and in the future, innovation is about open, inclusive, full of exploration and harmonization to extract the best results. We seem to have really grasped and recognized the combination-effect that comes from the myriad of different linkages that is propelling innovation activity and bringing increasing confidence within the boardroom. According to a recent PwC report, optimism has dramatically been raised around innovation, so much so the vast majority within the survey of 1,757 c-suite or executives respondents believe their aggressive growth plans will be driven by organic growth (93%) and not by previous means of M&A activity. They are talking more radical and breakthrough innovation. BCG in its 2013 report on most innovative companies is equally far more bullish on innovation. My only wish is this all this optimism is grounded in reality and recognition of what significant changes are required in structures, processes and supporting mechanisms that this increased innovation focus will really require. They will have to address the existing organizations constraints as well as rework the emphasis away from the efficient and effectiveness focus that has become engrained. This will require a very dedicated focus on understanding innovation management and what it really means, to translate this organic ‘wish’ into reality over the next five years. We are certainly seeing innovation has moved well beyond just products. It is exploring the value of combining or even separating services, changing value propositions on a more consistent basis and exploring new business models far more openly. 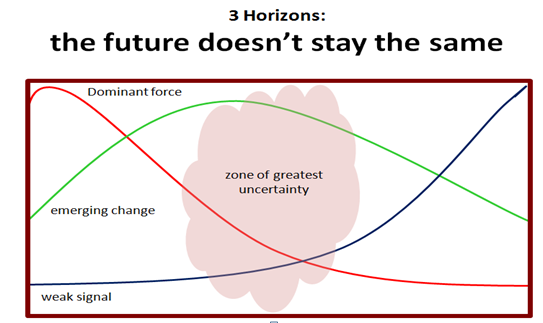 All these approaches to innovation are challenging and demanding far more constant reorganization around changing the innovation activities to meet the ‘breaking’ opportunities. One innovation struggle is around ‘rigidity’ within the organizations. Innovation requires a more fluid, adaptive and agile environment. This will require some significant changes within the approaches within managing within these structures and this takes a significant and dedicated approach to achieve. The end result is changing the way people are managed and valued. There is a need to draw in, to engage, more open to diversity in opinion and thinking and increased emphasis on fluid teams tackling issues and challenges in unique ways, not through standard processes and approaches. Research led or technology – based standing alone is not enough in pursuing greater functionality or breakthroughs, we need to cooperate with all the relevant people and partners that can bring the innovation idea or concept to fruition. The opening up to greater networks, exploring relationships and allowing them to deepen becomes vital. Allowing time for these to work and build the essential trust needed equally will take time. We are also seeing increasingly the disruptive era of simplification, which captures far more of the imagination and where the increased movement of future wealth generating opportunities lie by meeting targeted customer need. These are not ‘layering’ on features that have been the approach of the past, this is stripping away and rapidly breaking these back down into targeted applications that do the job, we the consumer or client wants, often willing to pay a premium upon. Complexity should not be about customers having to work out how to understand something; it is using the smart complexity that sits behind the solution to allow us to focus on what we need to achieve, to then help us significantly deliver on our required needs. Smarter searches, algorithms, designing your own options all are giving us the complexity we need. Simpler, interactive interfaces to do the job we wish to do, not forced to spend time learning and doing. Exploring the effects of reverse innovation and lean approaches. Reverse innovation, jugaad or frugal innovation is where there is a huge potential – still largely untapped in developed countries offering new avenues to real targeted growth. What about the strong underlying movement in start-ups that is far more ‘needs related’ or serving ‘unmet needs’ through lean approaches and customer development techniques. These are so much better understood than the approaches in the past, of simply cruising along for opportunity with a vague business concept. Sharpening the minds, changing the mindsets. Everything has become so much sharper in why we have to focus our minds down, it is far more on what and where innovation can give us the next growth opportunity and that comes from all the diversity we can muster. Managing in the global innovation space is no different; we can get far more quickly at answers on a global basis than at any time in the past. We are learning to tap into this global knowledge in different ways, it needs a dedicated focus and understanding, to find the unique mix that suits your needs and knowledge accessing and translating and then we are closer to the solutions that have the global unlocking key. We are using the ability to engage, to explore and exchange through a variety of social mediums, we can collect and interpret larger amounts of data than ever before. As growth comes increasingly back on the agenda for most organizations, it will come far more from exploiting through this organic growth approach. Yet to achieve the ambitious growth targets that many organizations are seemingly talking about, there needs to be a radical overhaul of internal innovation understanding and structures. All of what has gone on previously needs to be revisited and in many cases reworked through new practices, new systems and new measures. Organizations are coming rapidly to the point of needing to be innovation re-engineered to make the sizeable changes they must achieve to ‘allow’ organic growth to deliver. Innovation challenges much that is presently established within organizations, there is potential higher risks, significant changes required to be enacted within the organizations, with a whole raft of different competencies and capabilities to be learnt to extract the ‘promise and value’ from the innovation needed. We are forced to look harder for attracting growth into our business and innovation can provide the force if there is the commitment backing the rhetoric of needing organic growth to be the primary driver of over the next five years. I am sensing a really positive shift in innovation practice. It does seem to have gone up a notch or two in its maturity and adoption within our organizations in recent months. Can you feel the changes or are we still at the intent stage? Are organizations fully commitment to what shifting to an innovation emphasis will mean? Or are we only at a recognition stage? There are significant sets of issues needed to be addressed to really allow innovation to drive growth. Organizations need to consider very radical shifts in approaching innovation and its management to gain any momentum, so intent can meet these organic growth ambitions as suggested? For me, in the next twelve months it will be the level of activity to begin to re-equip organizations will determine if this is a reality or just C-level rhetoric, worried over the alternatives of low or no growth prospects but staying risk adverse.